The idea of us travelling throughout Vietnam following the exploits of Ha Noi T&T really kicks in now; the first away match of what will hopefully be a successful season for T&T. It’s one thing walking in the rain to the Hang Day stadium but can spending every other weekend to follow this team that I know pretty much nothing about really come to light? Can I really commit to the whole season, knowing that once I start it’ll be incredibly hard to stop? Over a few after work drinks the evening before the game my excitement began; my mind kept slipping back to ‘the big game’ at hand. Would I honestly set my alarm to wake up early on a Saturday morning to travel to Ninh Binh? Seriously, this is not like knowing you need to wake up to travel up to Old Trafford for a top of the table clash (and I’m not a southern united fan). I found myself awake and not only dressed but showered too, at 7am; albeit a little hungover. A steaming bowl of Pho soon fixes this and we’re on our way. T&T’s first away game of the 2013 season. Opting to avoid the more direct route on the thunderously busy A1 highway to Ninh Binh we chose the more scenic route following the Ho Chi Minh highway south. The scenery is breath-taking with beautiful karst formations separated by bright green rice paddies and clear flowing rivers. This route was more than double the distance at 200km and some very slow roads (also known as bumpy dirt tracks), but it is well worth the effort. Cutting back across country through Cuc Phung national park and through numerous villages we were rewarded with stunning views and a sense of tranquillity not to be found in a bustling city. 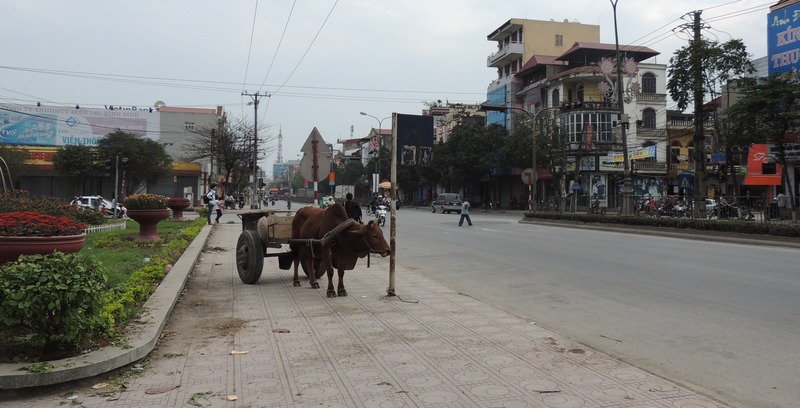 The narrow streets that surround the Ninh Binh stadium are a hive of activity, not selling merchandise as one may expect before a game, but a very colourful market selling everything from live frogs to sugarcane freshly harvested from the surrounding countryside. It was here that I spotted the first away fan clad in the bright yellow of T&T, excitement levels began to rise. Soon we became aware that we were the only foreigners anywhere near the stadium, bewildering stares flooded our way. The T&T faithful were gathered outside the main entrance, complete with yellow attire, flags and the drums. We must get in to the away section. Picking up two tickets at 30,000 VND each we headed to where we thought our entrance would be, even gesturing ‘T&T’ and pointing to receive approving acknowledgments. On entry our tickets were ripped and discarded. 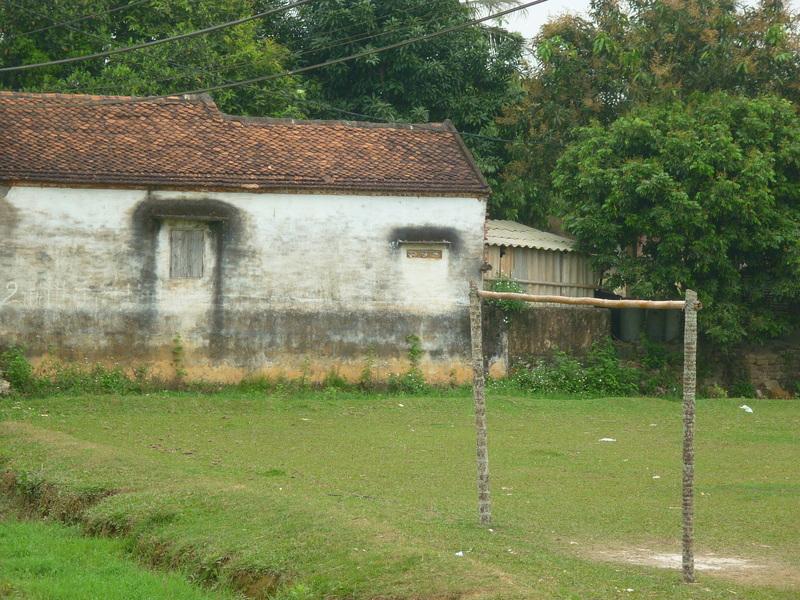 Ninh Binh stadium, on the right side of the fence! Entering a new stadium for me is always exciting, climbing the stairs until the full view of the pitch and surrounding stands comes in to view always fill me with excitement. This was no different; I even remarked that there are fences for segregation, for some reason I didn’t expect this. With each step the buzz was building, we stepped on to the stand and started to take in the view. It was at this point we realised we were about to fail so early on. I was correct in spotting the segregation so early, the separation of ‘us and them’, ‘home and away’ ‘yellows and reds’ in this case. Unfortunately we were on the wrong side of ‘us and them’; we’d entered the stadium one turnstile too early and had ended up in the Ninh Binh section! Panic set in, what do we do? Our tickets were in numerous pieces on the floor somewhere and our grasp of the Vietnamese language is not existent in such a situation. Running back down the stairs and shouting “T&T” “T&T” and pointing to the next gate the security guys were mildly perplexed but definitely amused. Fortunately they shouted over and we were on our way again! So back up the stairs we go. Trying to play it cool and hoping that none of the T&T fans saw our stupidity a few moments earlier, we casually strolled in. I’d say there were possibly 40-60 fans, all clad in yellow t-shirts and waving flags or scarves. We were instantly welcomed with stares, then puzzled looks and finally big smiles. I didn’t want us to just waltz in and sit ourselves amongst the fans that have been going to games for years and know each other well, respect had to be shown. We opted to go higher up the stand, towards the back of the T&T faithful. Three older guys gestured for us to sit with them and I thought this is it, we’ve been welcomed to the Hanoi fan base……strange foreigners, had we instantly been accepted? It seemed so; soon bright yellow flags and local homebrew whiskey were being pressed in to my hand. Strangely I initially declined the whiskey (fortunately the Vietnamese take a few ‘no’s’ before accepting a refusal) then I realised this needs to happen…..that was some damn strong whiskey. The first half began amidst a noise that I now find synonymous with Vietnamese football; two sets of fans rousing their teams with huge drums decorated in the colours of their club. Ninh Binh had lost their opening game away to Dong Nai, coupled with our first match success I was reasonably confident for a positive outcome. Once again our opponents set up in a defensive manner with both central midfielders sitting deep to protect their defence. 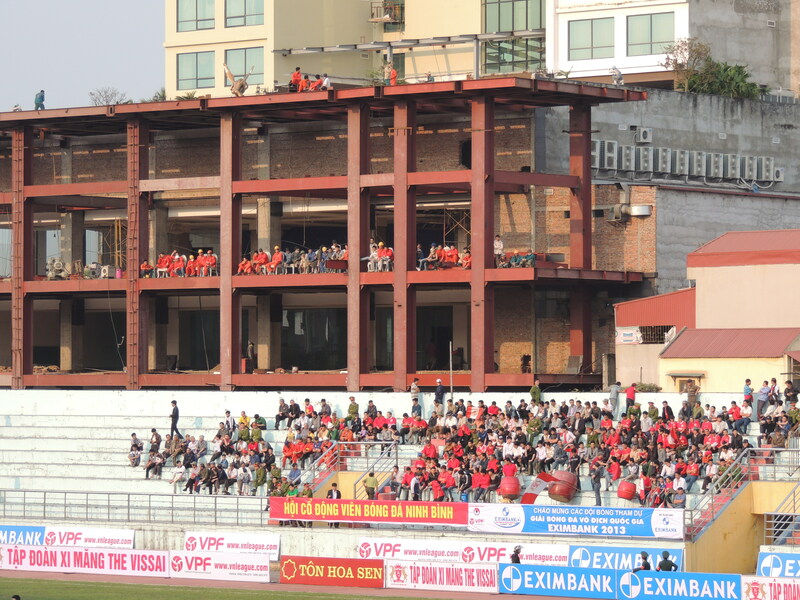 The first 15 minutes were rather cagey with Ninh Binh controlling possession. Inevitably it was the home side that struck first with Tran Manh Dung powering a fine headed past Hong Son in the T&T goal. 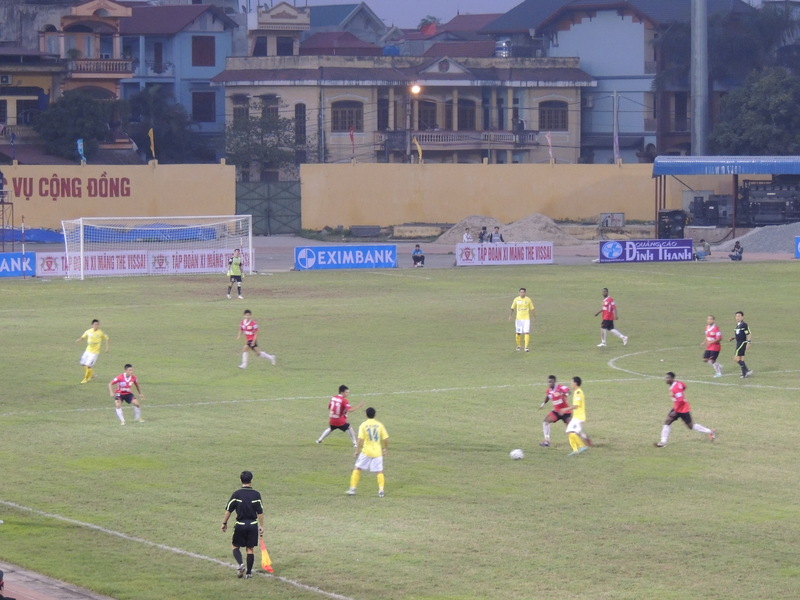 Eight minutes later and Ninh Binh were two up; some fine play down the left flank drew not just one or two defenders but the whole defence had an urge to move over and protect the right hand side of the box. This left Mai Tien Thanh with acres of space in the middle of the box to pick his spot and blast home for the second. Horrendous defending from Hanoi. 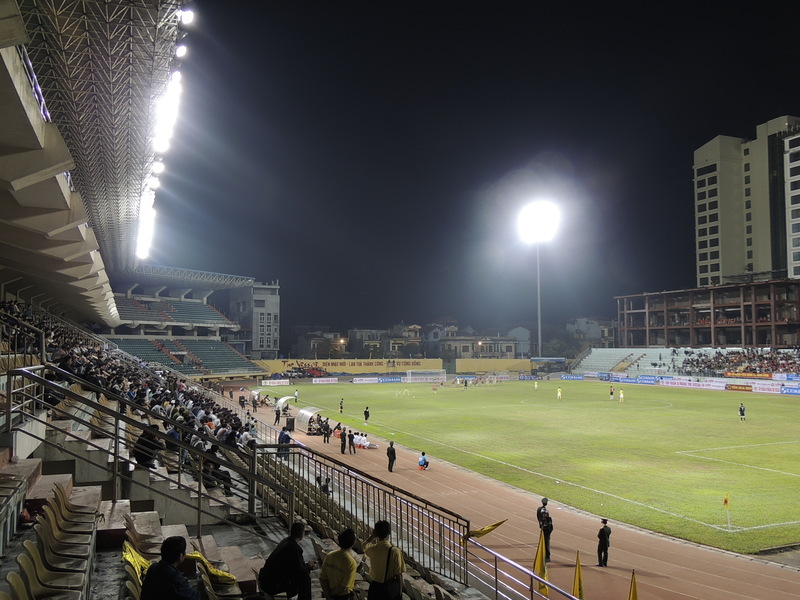 As the game went on Ninh Binh grew stronger and continued to dominate possession, with the central midfield pairing of Omoduemuke and Anjembe particularly impressive. Half time came and the atmosphere in the away end was subdued to say the least. It turns out I was next to the booze hoarding fan and some of the older fans soon came up for a half time session and my newbie pass was soon forgotten. As the second half dragged on with Ninh Binh in complete control I was starting to wish I’d consumed more of the whiskey. T&T were just not in the game. Samson, Marronkle and Duy, all impressive in the first game, were starved of support in attack, continuously coming up against the six man Ninh Binh defensive wall. The strange thing for me was that Phan Thanh Hung, the Hanoi coach, didn’t make a single substitution. With so many ineffective players on the field some new impetus was dearly needed. The final whistle went, but not before Ninh Binh had a great chance to finish the game in style, with a shot that came back off the underside of the bar and barely stayed out of the Hanoi goal. I’d recently read a translation of the various compliances that all clubs must provide on a match day and one stuck in my mind as rather odd. All teams must agree to keep the floodlights on for a minimum of five minutes after each match; surely a given in my mind. But no, upon exiting all of the lights above the away end went out and we were plummeted in to darkness. Negotiating the stairs out then became tricky, especially as I’d noticed that the area at the bottom also doubled as the toilet. This was not a time to trip. Fortunately I didn’t. At this point I had my first broken communication with the fan ‘leaders’, the wig wearing megaphone owners. We established I am from England, smiled and headed out in to the crowds.